Being part of the Sam Houston Austin Internship Program is a full-time job, and being a LEAP Ambassador consumes much time as well. But spending a semester in Austin, also offers numerous cultural opportunities as well, and thus it was that Christina Perez (former LEAP Ambassador and SHAIP Intern, currently Legislative Director for Rep. Jim Murphy) and Ilexus Williams (current LEAP Ambassador and SHAIP Intern for Rep. Mando Martinez) made their way to the Umlauf Sculpture Garden, which was unveiling a new exhibit featuring James Surls. Surls is not only an internationally famous artist, he is also an SHSU Alum, giving him something in common with both Ilexus and Christina. 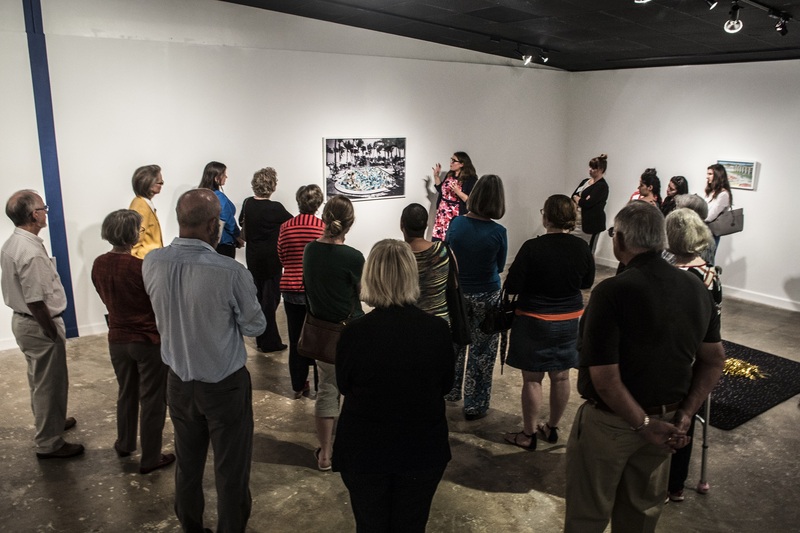 The LEAP Ambassadors also host heART of Huntsville each fall, in which they highlight Surls’ work in Huntsville and at SHSU, and they have visited museums with his work all over the country. In a stroke of good fortune, Surls was present at the opening of his exhibit, and Williams and Perez were motivated to attend, allowing them the chance to meet the artist. They also had the chance to explore 30-plus pieces of Surls, most of which embodied his characteristic blade/swirl motif, while also reflecting the organic theme that typifies his art over his five-decade career. 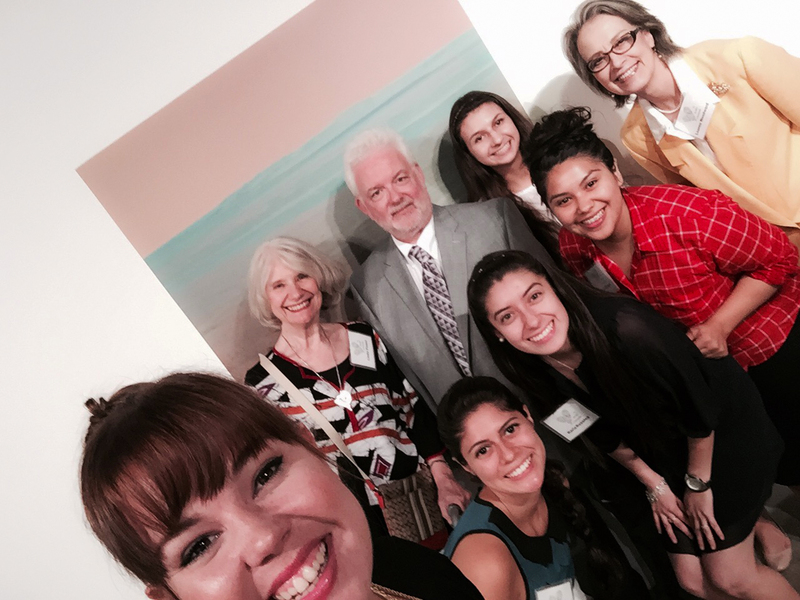 It was a fun experience for two young professionals who have fun with art. 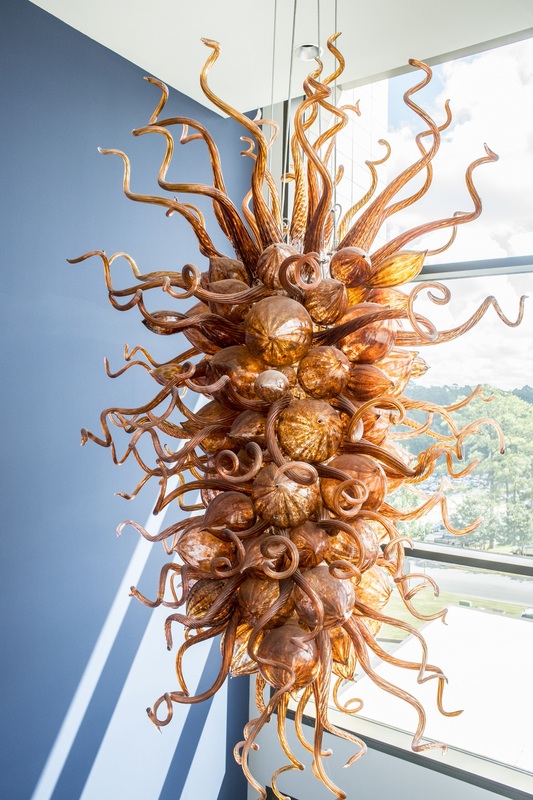 The Umlauf Sculpture Garden is located at 605 Azie Morton Road, is open Tuesday-Sunday, and will feature Surls’ work through August 18, 2019. James Surls, the American Modern artist and SHSU alum, opened a show at the Wynne Home Arts Center on Saturday, November 5, 2016. 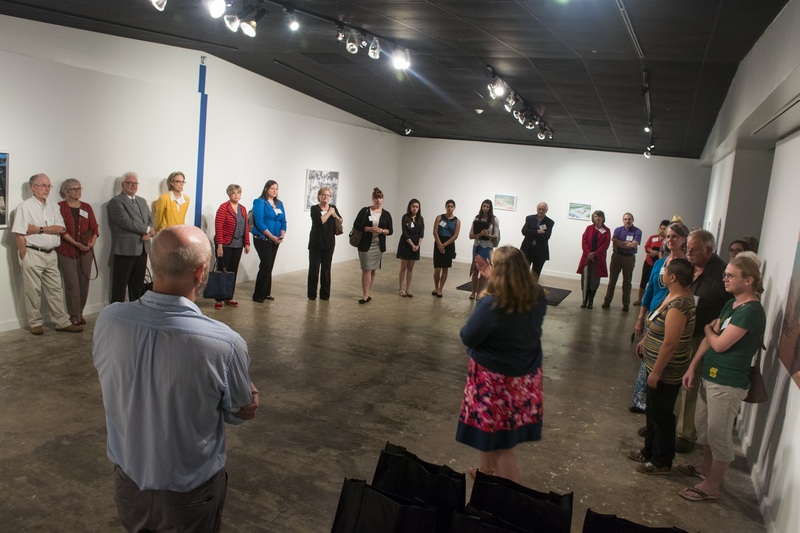 The event attracted more than 100 visitors, with the opening reception sponsored by the Friends of the Wynne and staffed by the LEAP Ambassadors. It was a sentiment shared by many of those who attended the opening reception. Included in the Wynne Home exhibit was a combination of Surls’ sculptures and sketches, both of which elicited praise from the opening night’s visitors. Surls was personable, speaking for about 15 minutes and explaining some of the pieces in the show. He divided them into feminine and masculine pieces, with the feminine pieces being more curved; the masculine pieces being more angular. He also spoke of his love for his wife, and how it has impacted his art. Following his discussion, Mr. Surls was nice enough to sign some photos of his work that we brought to the show. He graciously did so, while chatting comfortably with us. The exhibit will stay up for six months, twice the usual length of a show. In the past, the Wynne Home has had exhibits featuring David Adickes, Jesus Moroles, Ken Zonker, and Stanley Lea. The Wynne Home also offers art classes to the public in the Fall, Spring, and Summer. The classes include topics as diverse as classic film, salsa dancing, oil painting, and cooking. The Wynne Home is open Tuesday through Saturday, and admission is free. The LEAP Ambassadors would like to thank Wynne Home Director Linda Pease, Friends of the Wynne President Nancy Gaertner, Friends of the Wynne Vice President Genevive Brown, and the entire Friends of the Wynne board for the opportunity to assist. And, of course, we’d like to thank Mr. James Surls for his art and for his appearance in Huntsville, Texas. Excited murmurs could be heard from Art Building F as people were flooding in for the LEAP Centers’ 2nd annual heART of Huntsville program. 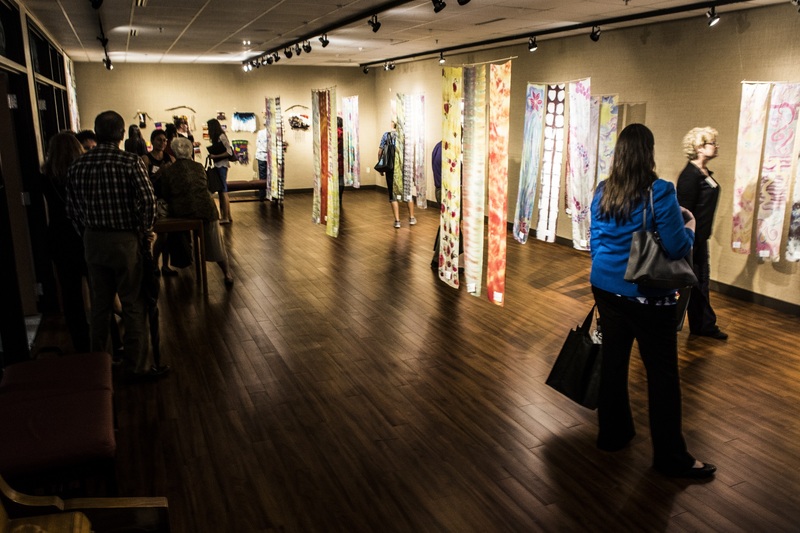 Art enthusiasts from SHSU and the community are annually invited to this four-week program where they can explore various art media created by local artists around the SHSU campus and the picturesque town of Huntsville. We started out in one of the many classrooms of the Art Department. The LEAP ambassadors were elated to see many of our community friends such as former mayor Mac Woodward and Wynne Home Director, Linda Pease; as well as friends on campus such as English Professor, Dr. Ralph Pease and Political Science Professors, Dr. Tom Haase and Wen-Jiun Wang. After everyone had finished their survey of local art and artists (not without a few grumbles), Dr. Micheal Henderson, chair of the art department, welcomed us to the the Gaddis-Geeslin Gallery. Inside the gallery, Dr. Henderson presented us the “Selections” exhibit by revealing the type of art that could be found within. 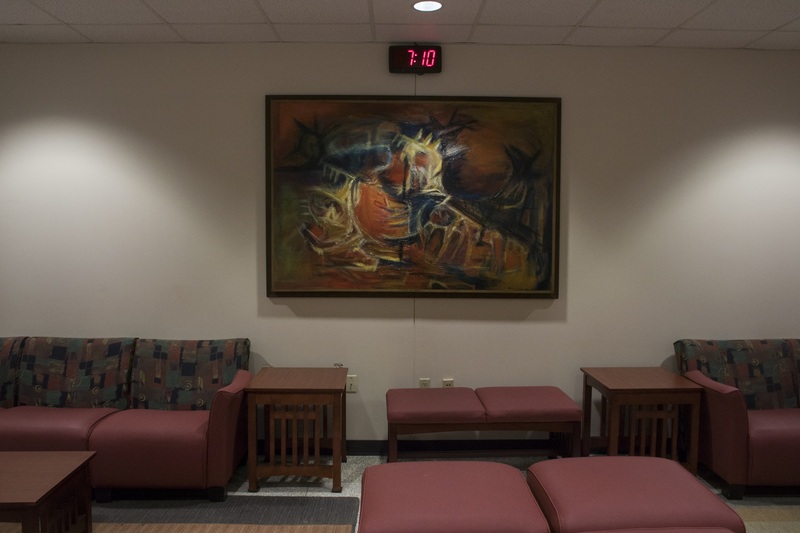 The art gallery consisted of creations from alumni dating as far back as the late 1930’s up until the Spring semester of 2016. There were many pieces from former SHSU professor Ken Zonker. The artist had a special resonance for Leap ambassador Beatriz Martinez, a previous Wynne Home Intern who had organized a Zonker exhibit. There were also pieces by Zonker’s apprentice, J Miller, who had actually painted a portrait of Mr. Zonker. Exhibited was also a painting by the renowned sculptor James Surls (whose art would appear later in the tour). Titled Cockfight, Surls produced the work in the late 1960s while he was still a student at SHSU. 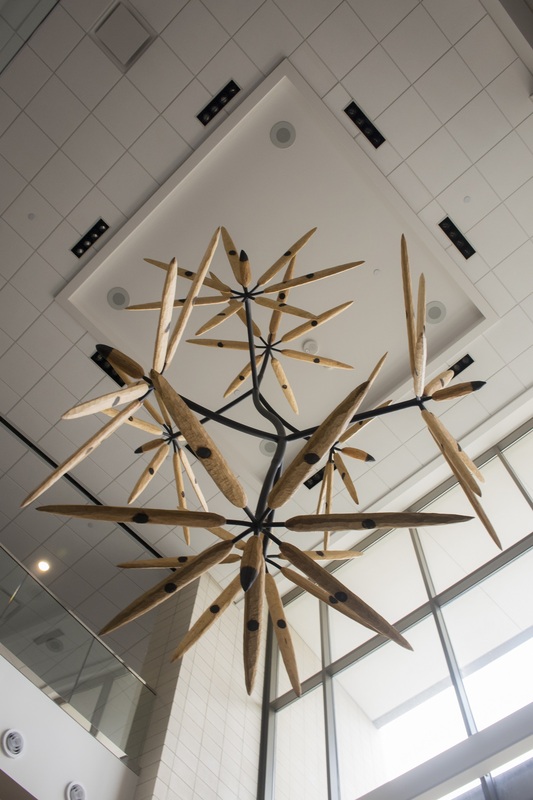 At this, few of the attendants revealed how the had been friends of Surls at a younger age, and we spoke with Dr. Keri Rogers, who several years ago helped hang this piece in the LSC. …we decide to head on over to the second stop: the College of Humanities and Social Sciences (CHSS). As we got closer to the CHSS building, we stopped outside to gaze at the Water Wall by Jesus Moroles. 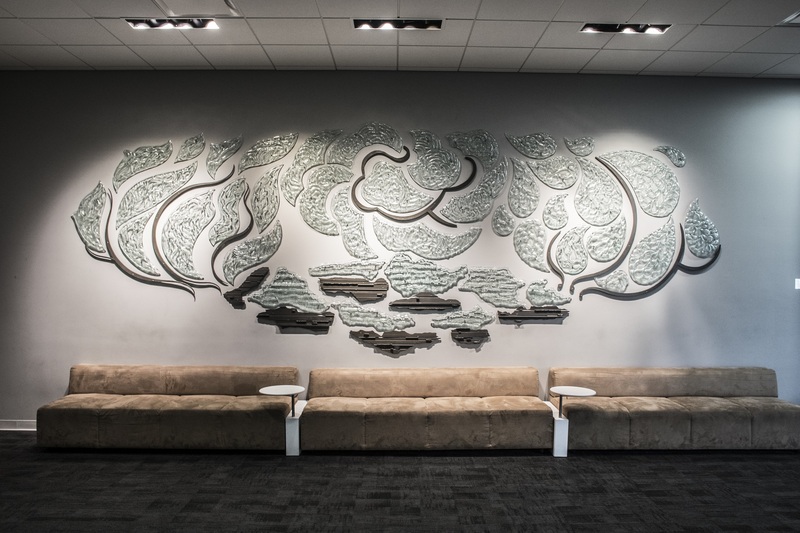 This 9-ft wall was erected to harmonize the elements of earth, stone, and water. The attendees where then amused by how Jesus Moroles (as a lover of multimedia art), had planned to unveil the sculpture by having SHSU dance majors dance atop the CHSS building’s roof. Fortunately for us (and the dancers), their platform became the top of the Water Wall. The Water Wall’s intended function was to offer a venue for outside lectures. Currently it is most often used as a great study spot for students, and is occasionally seen hosting CHSS socials. Once inside, we saw a piece by Bruce Marion, Confluence, lining the walls. Seeing as how the Humanities and Social Sciences college deals with human interactions and circle of connections, Marion transitioned colors and interwove circles to showcase these two ideals. The group later traversed through the summer heat to the Lowman Student Center Art Gallery, which was probably the LEAP Ambassadors’ favorite gallery, as they had spent many hours, nails, and mounting squares in order to set up their very own LEAP exhibit. Showcasing the various features of the LEAP center, such as special speakers, fine arts, volunteerism, experiential learning, programs, and travel, it gave heART of Huntsville participants an opportunity to gain a further insight of the different fields in which LEAP Ambassadors engage. From there, we went to the Nancy Gaertner Performing Arts Center where Craig Brossman, the facilities manager of the building,was waiting to give us a tour. We toured the Concert Hall, which impressed the heArt of Huntsville participants as it has been named one of 25 best art venues in the nation. Equally impressive was the dance theater with a sprung floor which is tailored to fit a dancer’s needs. There are only 2 or 3 like it in the state, and about a dozen in the nation. We proceeded to view Kathleen Ash’s Elements, Stanley Lea’s Four Seasons, and a serpentine marble sculpture by Jesus Moroles. The most prominent installation was the 16 ft, wood and steel, Around the Flower Wall by James Surls. We also got to see some art from Charles Pebworth, whose first and biggest sculpture lies in the Woodlands at about 40ft tall. As we were exiting, we saw Jason Lawrence’s Firedance, our last beacon of crystalline light as we retired for the night. Or at least until we got to Austin Hall. This historic building awaited us with food to be deliciously devoured upon as we interacted with the other participants and shared our anticipation for next Monday’s adventure, which will start at the grand Sam Houston Statue on Monday, September 19.